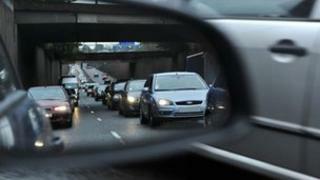 The cost of car insurance is falling at a record rate in the UK, according to the insurance arm of the AA. The average annual comprehensive car insurance quote fell to £594.84 this month, it said, down 9.8% from £659.53 last July - the biggest decrease since the AA insurance index began in 1994. It said the dip was thanks, in part, to clampdowns on fraud and restrictions on claims management companies. Despite the fall, premiums remain much higher than they were six years ago. Third party, fire and theft quotes also fell between July 2012 and this month - down 4.8% to £820.58 on average, AA Insurance's research suggested. BBC business correspondent Joe Lynam said the 9.8% fall in comprehensive cover quotes follows a 6.4% fall over the course of 2012 - itself a record. But he adds that the cost of insuring the average car is still twice as much as it was in 2007. At the start of April, a ban on referral fees was introduced. They were paid by lawyers and claims management firms to breakdown firms, brokers and the insurers themselves, in exchange for providing information about accident victims. Also, anyone suing for accident damages with the help of a no-win, no-fee lawyer - known as a conditional fee arrangement - now has to pay their lawyer's success fee from their own funds if they win their case. It was previously added to the bill of the losing party. This has made claims more expensive to pursue. And new gender equality laws have lowered premiums of men by far more than expected while women's premiums have remained static, according to AA Insurance's research. Fraudulent claims - especially for whiplash which is often difficult to disprove - are also down. AA Insurance director Simon Douglas said insurers previously faced "a fast-widening gap between premium income and claims costs - largely driven by whiplash injury claims and fraud, which saw very sharp premium increases between 2009 and 2011". "That gap is closing and premiums are falling again thanks to competition, as well as improved fraud detection by the insurance industry and tightening of the law that is beginning to curb the number of spurious new whiplash injury claims," he said. "The news that hundreds of rogue 'no-win no-fee' claims firms have been reined in is welcome and, in part, falling insurance premiums reflect that." Graeme Trudgill of the British Insurance Brokers' Association said uninsured driving costs the industry £500m, whiplash claims £2bn and fraud £1bn. But these costs were now coming down, he added, because of a concerted effort by the industry, with "discounts now feeding through to policy holders". Justice minister Helen Grant said: "We are turning the tide on the compensation culture which has pushed up the cost of insurance for drivers, schools and business - and taking another important step to reducing the cost of living for ordinary people." Earlier this month, City regulator the Financial Conduct Authority launched an investigation into insurance companies for overcharging customers when they renew their car and house policies. The FCA says automatic renewal can lead to customers being treated unfairly. BBC Radio 4's Money Box revealed in March that loyal customers often pay much more than new ones for insurance. The insurance industry says consumers can shop around for the best prices in a competitive market.